Avenged Sevenfold News: Avenged Sevenfold in the list "Eight new albums highlight the late summer season"
Avenged Sevenfold in the list "Eight new albums highlight the late summer season"
Avenged Sevenfold, “Waking the Fallen: Resurrected” (Hopeless Records) Aug. 25 – Still riding high with the success of their 2013 commercial breakthrough album, “Hail to the King,” the members of Avenged Sevenfold are looking backward for their next release. It’s an expanded edition of the band’s landmark 2003 release, “Waking the Fallen” featuring the album in its original form, as well as a second CD of demos, unreleased tracks, and live versions, and a DVD documentary on the making of the album. 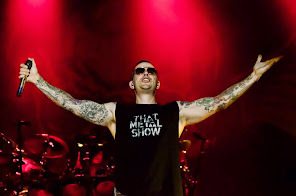 In a March interview with Loudwire.com, vocalist M.Shadows talked about the project.